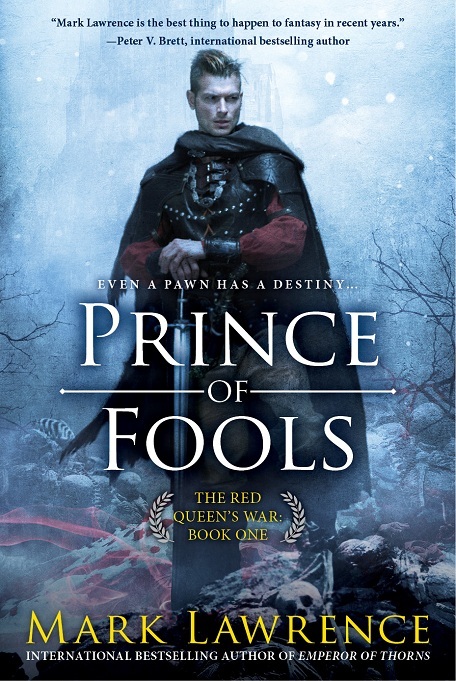 After two months of looking at Prince of Fools (Mark Lawrence’s follow up to Emperor of Thorns and the final book in my favorite series of all time) in my ereader queue, it is finally gone. PoF was my number one anticipated novel of the year so I did not want to read it to soon and I like to savor my favorite authors books. Expectations are high; Mark Lawrence has many fanatical fans, myself included. Before PoF came out, I already thought him to be the best current writer in fantasy, or in any genre, and an amazing and provocative storyteller. Does PoF live up to his reputation and fans expectations? An emphatic and resounding YES! By all accounts PoF is an amazing, wonderful book. And there is a dog in the beginning named Pluto, my dogs name, and a great name for a dog! First, who does not love vikings? I have been on a major viking reading theme and have probably read 30 or more books about them this year as well as following the excellent show, Vikings. In PoF, Jalen, also known as the Red Prince, ends up with a traveling companion who is a monster of a Viking named Snorri. Snorri is a total badass out for revenge for reasons revealed in the story. Jalan is of royalty and far down in the line of succession, and is very different than any main character I have come across, mainly he is a coward and a liar. The main characters, as well as the other minor characters, are brought brilliantly to life. Jalan could not be more different than Jorg (the "hero" of The Broken Empire series). As in the best books, the characters are believable and you want to see what happens to them. Often, I get halfway through a book and realize I just don’t care what happens to the characters or how the story ends up. This is definitely not a problem here. After each event or conversation, I anxiously want to see what happens next, not only in the story but to the characters. Neither Snorri or Jalan are particularly pleasant persons, yet there is a strong affinity with them. 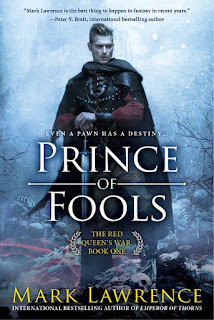 Having been so emotionally invested in the Broken Empire series, when Jalan and Snorri cross paths with some of the Brothers, as well as a certain young prince, I was astounded at what occurred. I set the book down for several hours after that because it was so epic! The Broken Empire was dark; very dark (some disagree). This is dark as well, but it is insanely humorous and definitely has a lighter feel. Jalan and Snorri’s witticisms and banter are hysterical. It had me laughing out loud multiple times and smiling untold times. Instead of the brutality featured in the Broken Empire, this book has humor. There is action, killing, and violence, done expertly and cleverly, but the humor is what jumps out for me. The writing is expert. No other writer is as clever as Mark Lawrence. The dialogue and narration are both concise and succinct. There are aphorisms galore. I bookmarked more pages than I can count to go back and read (my free ereader doesn't allow highlighting so this is one book I need to get up a physical copy). I had the idea to insert them in this review but much of the pleasure of reading Mark Lawrence is coming across them in context so I will leave them for the reader to discover. The plot is thoughtful and suspenseful and at times full of horror. There is magic of a mysterious type and it is very important to this story but not overpowering. We learn a lot about numerous new cities and towns as well as some lore and history of this post-apocalyptic world as Jalan and Snorri travel. We also meet very interesting people throughout the journey and it is always fun to see what Mark dreams up next and what obstacles the characters will face. With this book, Mark Lawrence shows he is one of the premier fantasy writers of this generation and of all time. I love the Broken Empire world and do not believe I would ever tire of it. No matter what Mark writes, I will be the first in line. But I do hope he continues in the Broken Empire with another series after this one. For now, I can not wait for book two. I recommend this without hesitation or qualification to everyone.